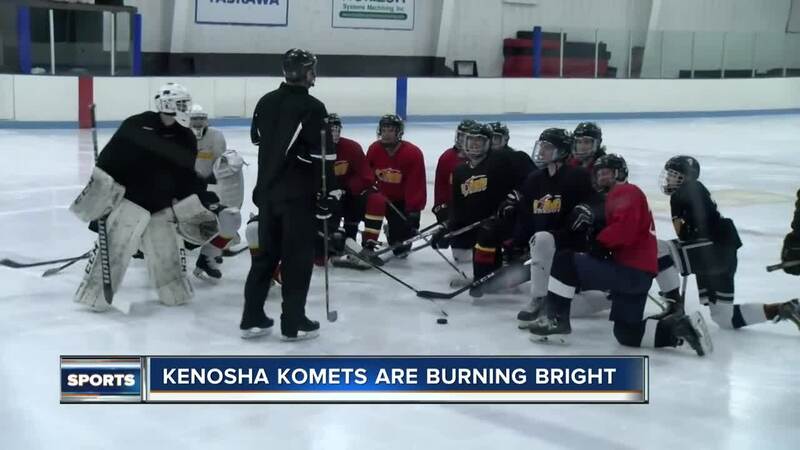 For the first time in 50 years, the Kenosha Komets U-18 hockey team has advanced to the USA Hockey Tier 2 National Championships. "My Dad managed the rink when I was growing up a kid so...to be able to come back, put in some years of coaching with this special group of kids," Head Coach Jason Myers says. "It just felt amazing...I wasn't even [sure] it was real. It was like a dream honestly, I didn't think we would come this far," Komets Center/Wing David Daavettila says. "We were not the favored team...by any means. So I don't think that a lot of people expected us to make it this far. So it's very cool to see these guys persevere through the hard games they had toward the end," Myers says. So what's the secret to becoming the first hockey team to represent the state of Wisconsin at a national tournament of this level? "They love to win, but they hate to lose...so, and I think sometimes that that's more important than even loving to win, is just hating to lose," Myers says. But going to San Jose, California is an added cost. And the kids need help, to get there. "Anything helps...like we have the Minnesota Wild owner donate. That was awesome," Daavettila says. "We have a GoFundMe page, that we're trying to raise some funds...that way, we have a fundraiser, on April 1...I'm just really proud of these boys, and what they've achieved. And all the hard work they've put in this year," Myers says. You can donate to the GoFundMe page here.